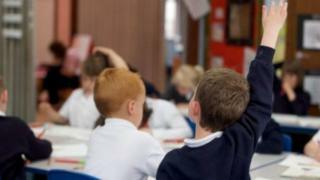 Members of Scotland's largest teachers' union have overwhelmingly backed a planned pay rise. The decision lays to rest the possibility of industrial action on pay by the Educational Institute of Scotland (EIS). The offer from the Scottish government, which was made earlier this month, would see them get a pay rise worth 10% by April and another 3% next year. Of the EIS members who took part in a vote, 98% supported the offer. The offer was made shortly before the union was due to begin a ballot on strike action. It still needs to be confirmed by the council body Cosla - councils employ teachers although pay and conditions are agreed nationally. If Cosla agrees, a formal pay offer can then be made. EIS general secretary Larry Flanagan said: "The proposal from the Scottish government, which EIS members have now backed, offers a three-year pay settlement of 3% from April 2018, 7% from April 2019, and 3% from April 2020, for a compounded total increase of 13.51% over three years. "It also includes additional commitments aimed at tackling workload, supporting teacher professional development, and enhancing the teacher leadership programme. "The package is good news for Scotland's teaching professionals and for Scottish education, and it has been achieved by the unity and determination of EIS members across the country." Mr Flanagan added: "This proposal, once formalised through the Scottish Negotiating Committee for Teachers, will ensure a period of welcome stability for Scottish education. Scotland's Education Secretary John Swinney said the EIS announcement was "positive" and reflected the "partnership approach we want to take with local government and the professional associations". He added: "Only Cosla as employers can make a formal pay offer and leaders will decide this on Friday. The Scottish government will support a revised offer which takes industrial action on pay off the table and sets our shared agenda for the next two years." If the proposed offer becomes the formal offer, it will be accepted by the EIS. Because of the size of the EIS and its role in the teachers' pay negotiations, it would be impossible for another union to secure a different pay settlement after the EIS accepts it. However, the NASUWT is continuing with its ballot on action. Its general secretary Chris Keates said: "Whilst there have been some improvements to the pay offer, the package put forward by the Scottish government and the employers fails to tackle all of the concerns of NASUWT members which include excessive workload and pupil indiscipline. "There is only passing reference to workload in the offer that has been made to teachers and therefore, as the NASUWT has advised the minister, we will continue with the ballot that is in progress to offer our members protection on all the issues of concern until such time as we see some tangible proposals on how teachers workload is to be reduced and on how all teachers are to be given their entitlements to a safe working environment."